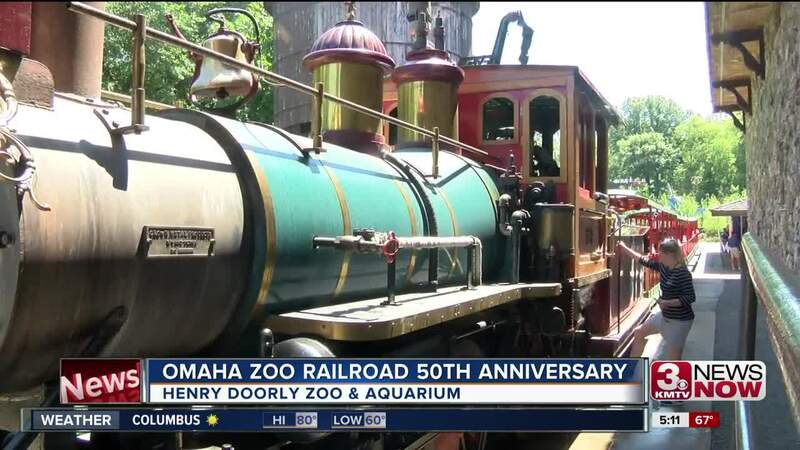 Omaha Henry Doorly Zoo and Aquarium is celebrating the 50th anniversary of its railroad this week. On July 23, 1968, then-mayor A.V. Sorenson and Edd H. Bailey, Union Pacific’s president at the time, drove the brass-plated “golden spike” at the ceremony that officially marked the completion of the Omaha Zoo Railroad. The zoo tweeted a historical photo commemorating the official anniversary on Monday. Debra, one of the regular engineers on the Omaha Zoo Railroad , said she never thought her job would be the most fun during July, one of the hottest months of the year. That’s when the train boards some of the biggest crowds all year long. Omaha-based Union Pacific assists with the operations of the Omaha Zoo Railroad and even laid out the railroad’s line in 1967. The zoo's train itself is pulled by a class 440 steam engine — a replica of Union Pacific’s engine No. 119 that pulled the ceremonial train to the Golden Spike ceremony in Promontory Summit, Utah, which celebrated the joining of the Central Pacific and Union Pacific Railroads. In celebration of the train's anniversary, the zoo will on Saturday give out free railroad-themed temporary tattoos courtesy of Oriental Trading Co . The zoo has also been conducting a trivia contest on social media; the winner — to be announced on the zoo's Facebook page — will have the chance to be an Omaha Zoo Railroad engineer. The train operates daily from 10 a.m. to 4 p.m.